I am still chuckling at the predicament we got ourselves into yesterday. 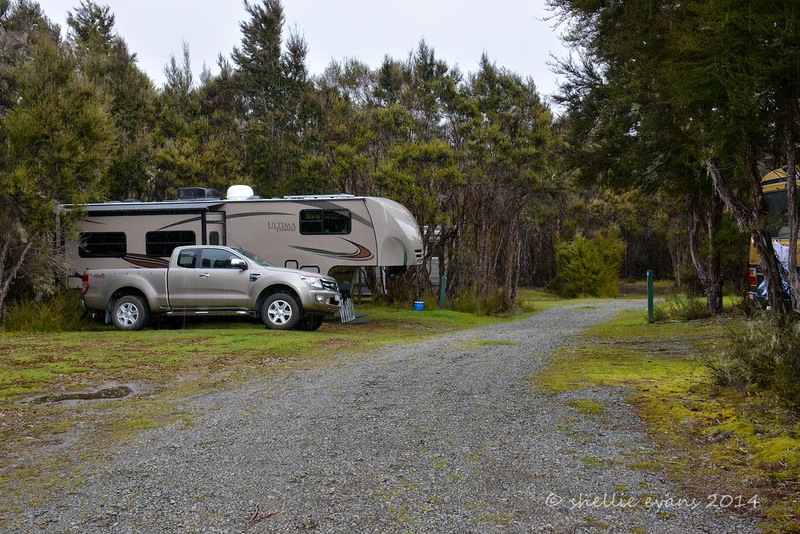 We left Whatamango in the morning, stopping in Blenheim for a short break, before continuing on down the Wairau River valley, 100kms inland on what is virtually a straight road all the way to Nelson Lakes. And what a pleasure that was, after nearly six weeks there were no twists and turns for miles, we could sit back and relax and enjoy the scenery as it flashed past. It was great to see mountains & snow again too. For well over half the distance the river flats are covered in established vineyards with many new blocks being added towards the end, where it seemed there was a bit of a dilemma for farmers as to whether they run with vineyards or dairy conversions, both lucrative options at the moment. 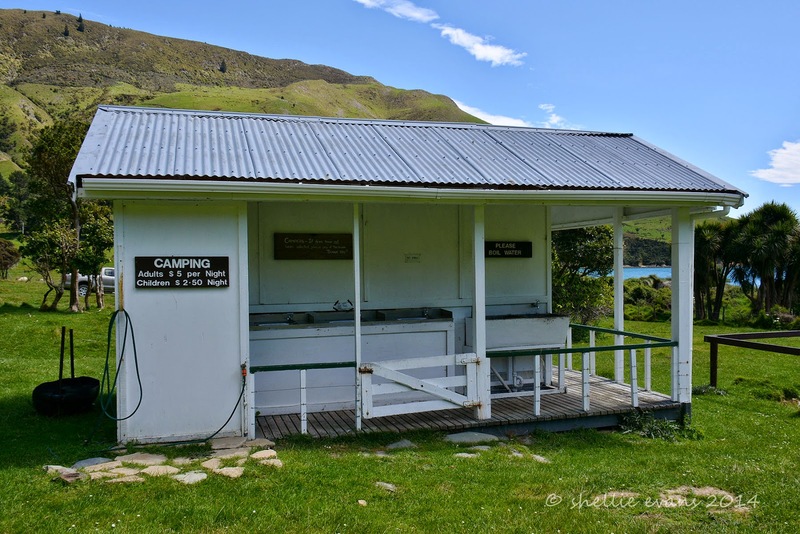 There are two DOC camps at Lake Rotoiti, the more well known and popular of the Nelson Lakes; Kerr Bay Camp & West Bay Camp. I had read that the larger of the two, West Bay, was closed for most of the year opening in December for the summer season but I did wonder if it was just the facilities that were closed and perhaps the sites were available for self-contained RVs. First, we drove down to the lake front and into Kerr Bay camp. It was small with hard stand sites & power available if required. These sites would be a problem for us with trees meeting over the top of the site. This would mean no satellite reception for TV, not an issue for a night or two but definitely not ideal for a week or two. There was a large grass area (for tents) and a couple of sites nearby that we’d probably be able to squeeze ourselves into but we decided to check out the West Bay Camp first. West Bay is a couple of kilometres up the road, it also has a small boat ramp like Kerr which will be great for David to launch the dinghy from. 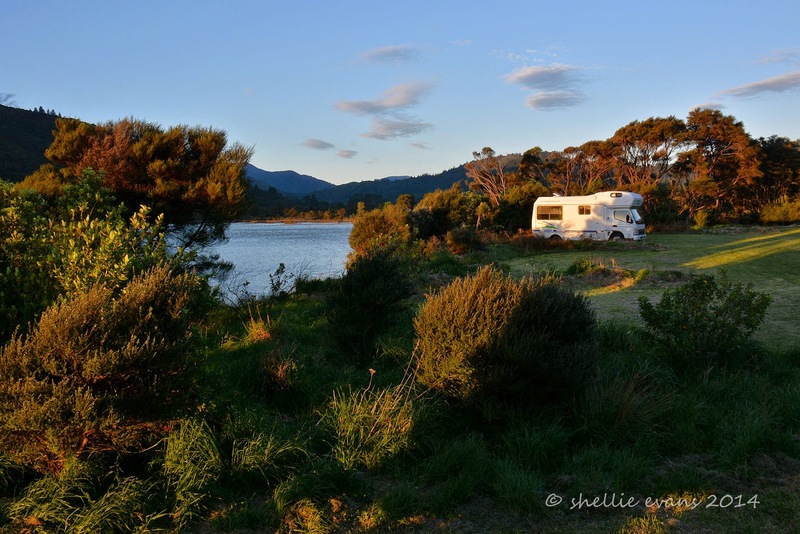 West Bay Camp has two separate camping sites and the whole area is surrounded by Beech trees, each individual site is set back into the bush. The first camping area, Jetty Campground, had a locked gate at the entrance so we continued on along the gravel road that ran along the lake front to see if the second section might be open. 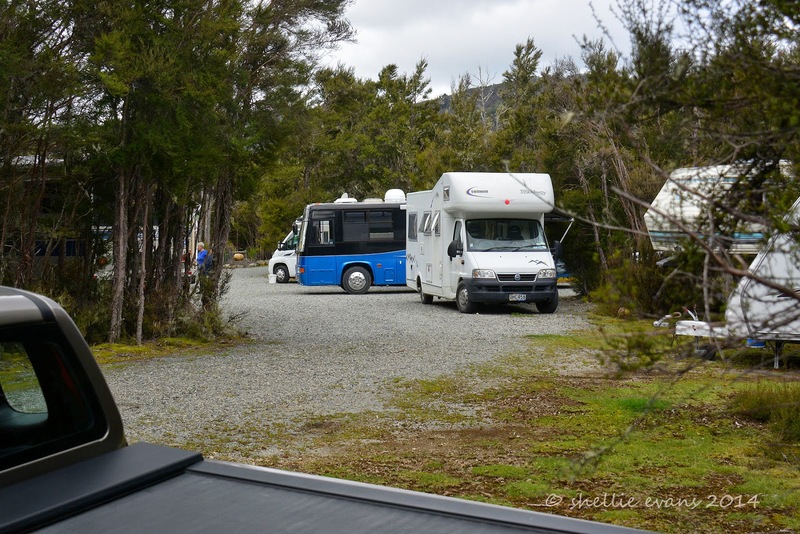 As we got to the entrance, a car & caravan ahead of us pulled into the driveway and ahead of them we could see at least half a dozen other motorhomes and buses parked up. Great! This site is open. We waited in line until the caravan ahead of us backed into their site, I walked down the track to choose the best site for us as it was quite narrow and the sites relatively small and then we pulled through and set up camp. David did an expert job at backing into the small space & over the the bumps and slope of the track and site. We called out a hello to the people in the caravan as they were setting up and I spoke to a few ladies that were gathered by the ablution block when I checked the DOC signboard. The board said to select a site and then go back to the DOC headquarters near Kerr Bay to register and pay. Once we were happy with our set up, we drove back down the road and around to Kerr Bay again, stopping in at the office where I told them we were parked up at West Bay Camp. ‘Oh, you’re with the rally group then?’ said the woman behind the counter. ‘Rally group?’ I said, as it suddenly dawned on me why there were so many RVs gathered together on a overcast Thursday afternoon out in the middle of the mountains. I had thought that perhaps they were here because there was a long weekend coming up for Marlborough (Anniversary Day). 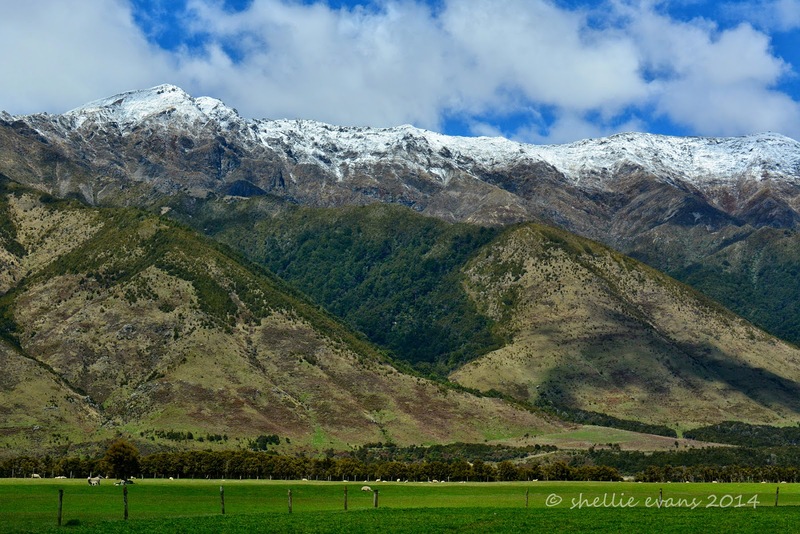 Even though Nelson Lakes is in the Tasman area it’s not too far to come for Marlborough people. Bloody hell I thought, now what to do. What a couple of idiots we are, tagging on the back end of a rally. I didn’t know whether to laugh or cry. I found out that it was the Nelson/Tasman Area rally before we drove back to the site. Of course we could attend the rally if we wanted, we are members of NZMCA, and guests can attend rallies if they are in the area. 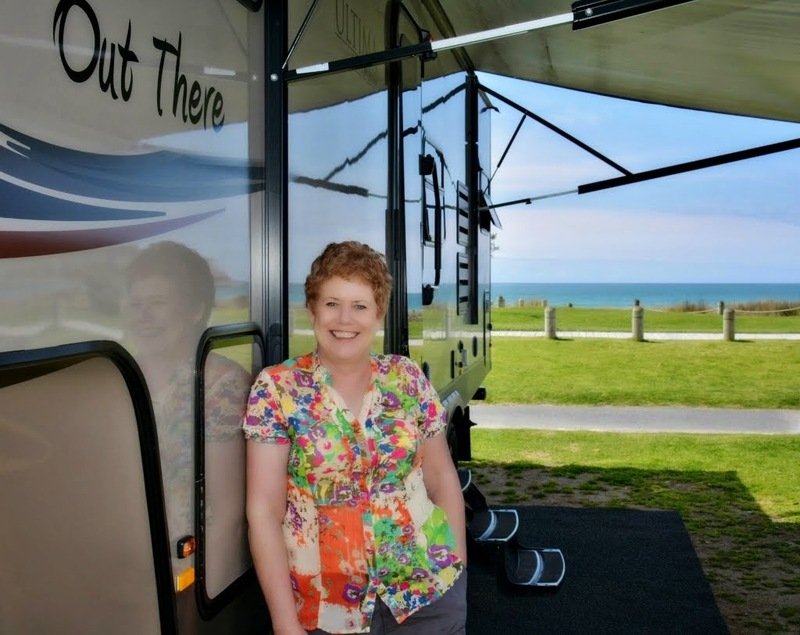 But we’re not rally people (even though we have attended a couple in the past) and we certainly didn't want to start our Nelson Lakes experience by being part of one. We snuck back into the van keeping out of sight and debated what to do. It really was quite funny, I kept laughing which wasn't pleasing David too much. It was quite embarrassing too, no wonder everyone was so friendly. They must have been thinking who the heck are those people and why haven’t they introduced themselves. David wanted to make a run for it, I thought perhaps we could just stay the night and sneak out early or go and tell them we had an emergency and had to leave suddenly. The problem was that to get out you have to pass through all the vans (and congregating people) that had parked in a circle at the entrance way. We started packing up and David said he’d go and apologize and explain that we had just followed the caravan in thinking the site was open. I said I’d hide inside the van as we drove out. He suggested I walk out the gate and he'd pick me up down the road. I was worried he'd have no one to guide him around the trees. 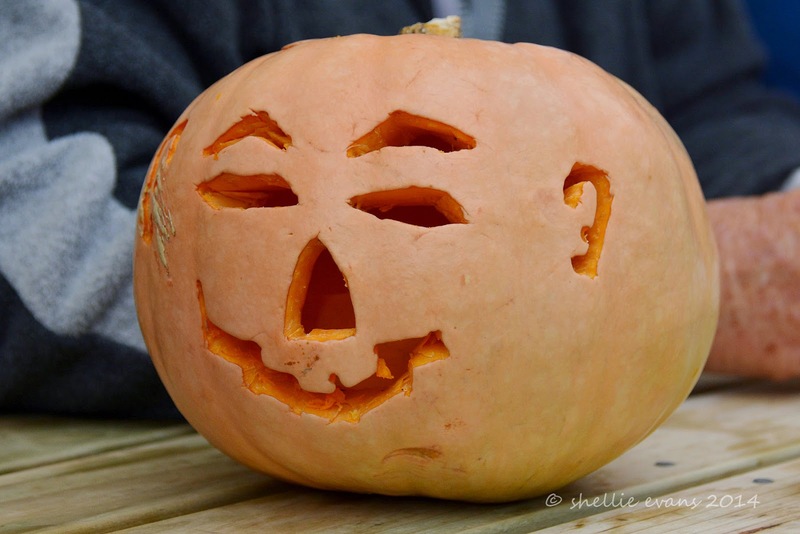 How silly can you be! To cut a long story short, David returned to say what a lovely group of people (of course) they were and that they really wanted us to stay. They had a great programme organised with talks from DOC and walks in the area and that most of the group would be arriving today for the weekend events. And anyway they’d just put up the canopies (canapés?) & ‘Happy Hour’ was about to start …..
And if this truck had arrived before us it would have been very clear what was happening, and of course today there are signs outside the gate letting everyone know where the rally is. So that is how we became accidental attendees of the Nelson/Tasman Rally. And thinking about it, after spending 12 weeks in the Nelson/Tasman area I’d class ourselves as honorary members anyway! The sun sets over Kenepuru Sound and after a wonderful ten days, it’s time to hit the road again and finish exploring the Marlborough Sounds. 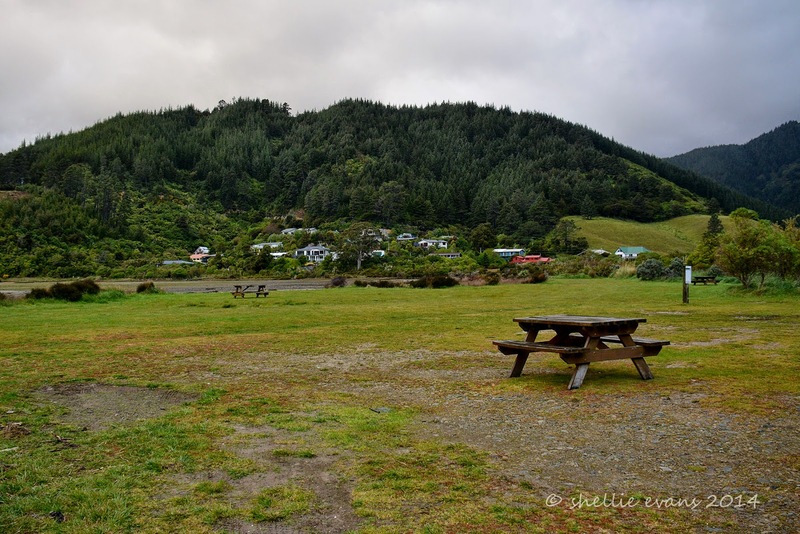 We loved having the DOC Kenepuru Head campground to ourselves for most of the time we were there but when the long Labour weekend brought at least a dozen campers to the site it was great to have some company for a change. The campground is so large that there was plenty of space for everyone to spread themselves around. After having fantastic weather all week the rain & wind arrived on the Sunday of the holiday weekend which was a shame for those that were in tents and/or had only come for a couple of days. 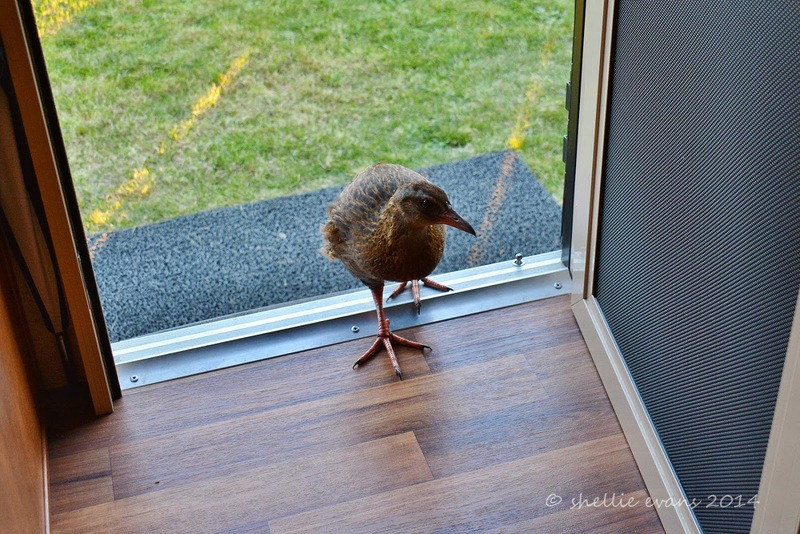 Of course our departure wouldn't be complete without a weka inviting himself in to say goodbye. He got a short shift! Without any stops, and travelling slower through all the twists & turns with the 5th-wheeler on the back, made the 40km to the main road feel a very long way. 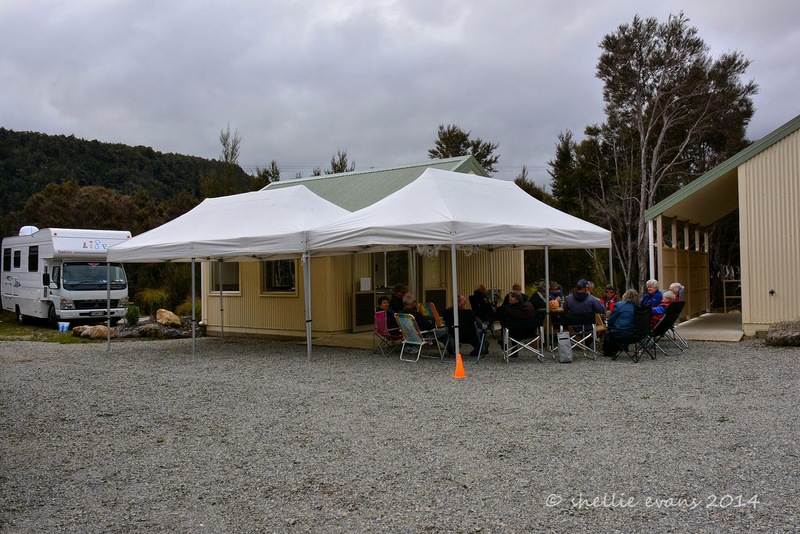 We were heading to the DOC camp at Momorangi on Queen Charlotte Drive which is just 6-7kms on from the main road junction so it was good to know we didn't have too much of a journey ahead of us. Momorangi was on our radar because it had a small boat ramp & good access to the Sound without us having to worry about the tide. David was keen to see if the snapper had arrived. Unfortunately our plans were foiled. 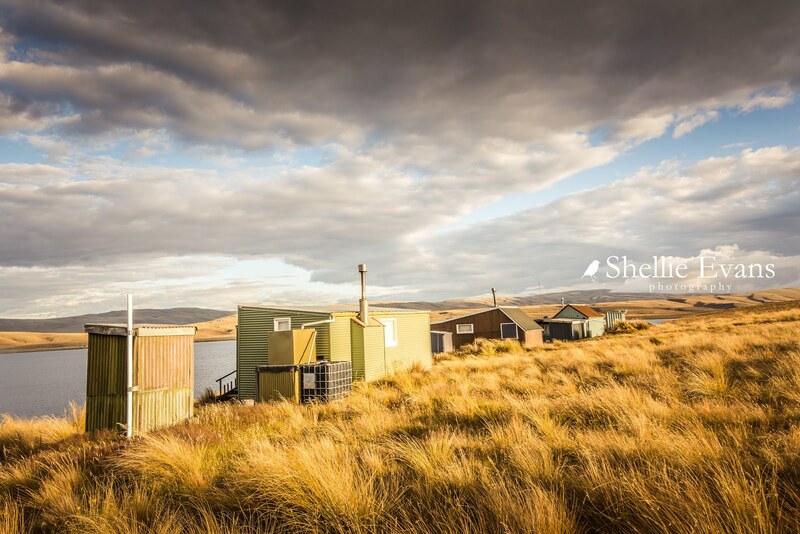 We knew that Momorangi Camp was being upgraded over winter and that they hadn't quite finished them, but we didn't know that they actually have a long way to go to complete the changes. 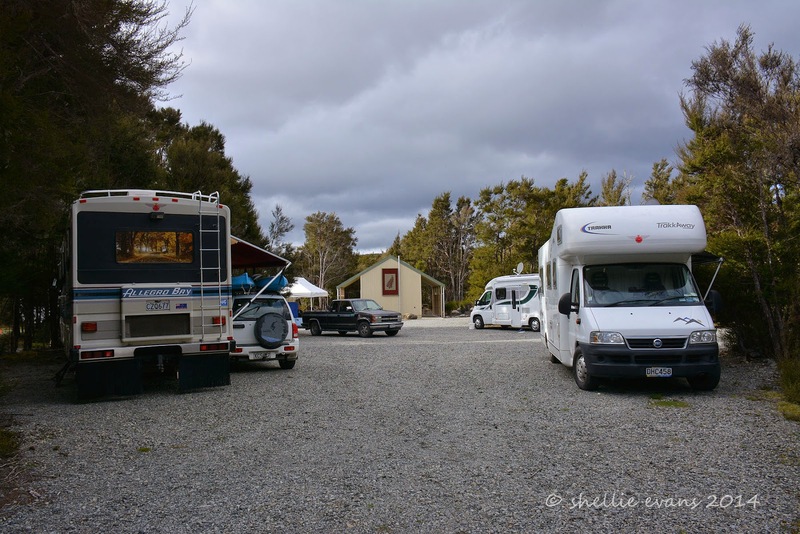 The Momorangi Campground is leased out and while its in a nice spot it’s more like your usual campground with all the facilities, it also has the main road running through the middle of it. 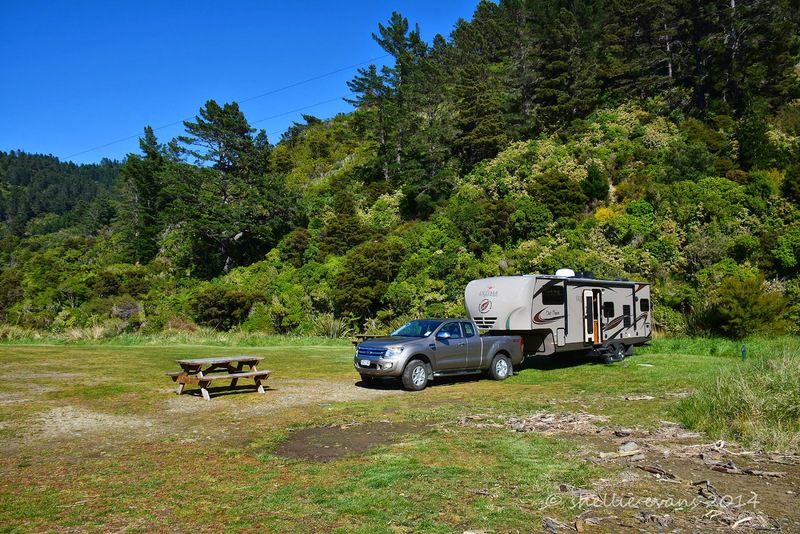 After coming from the quiet and remote Kenepuru Head it was a bit of a shock to find such a busy site with earth moving machinery and workman everywhere along with sections of the campground roped off. So we made the decision to continue on to Picton and around to another DOC site at Whatamango Bay. 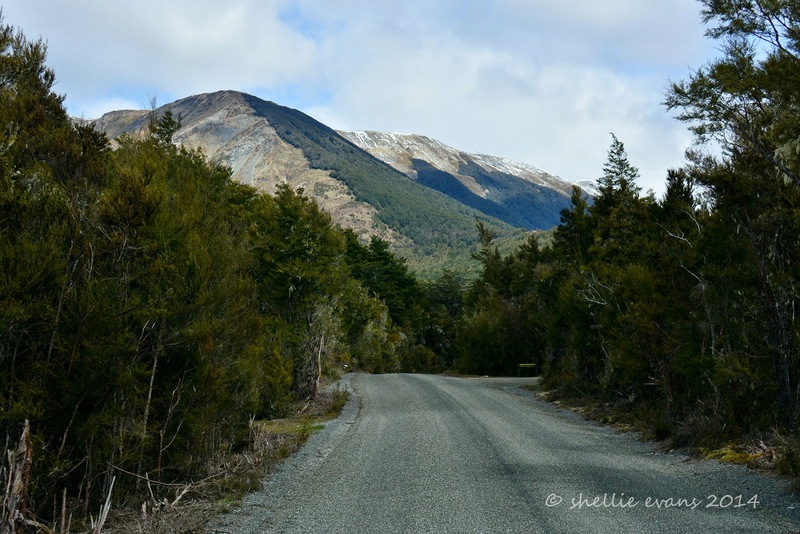 Queen Charlotte Drive is one hell of a road, it’s a narrow and winding (what’s new) scenic drive that links Picton with Havelock. Most sane people travel the extra distance and join the two towns by travelling via Blenheim, it’s longer but faster and the roads are fairly straight. Not us or overseas tourists, we want to see the sights. I think I saw a sign post flash past that said no vehicles over 9 metres. Too late. By the time it registered we were well past and we couldn't turn around to check. Oh well, we’re used to these roads by now. The road was narrow, and it was very winding, and it climbed up a few hills but none of these faze us much any more. It was the amount of traffic coming the other way, and mostly driving down the centre of the road, that was the worry. I know it’s narrow but there is a centre line for a reason, and if you have to cross it, slow down and check nothing is coming the other way before proceeding. These cars just pressed on seeming to take no notice of the fact that we were approaching. 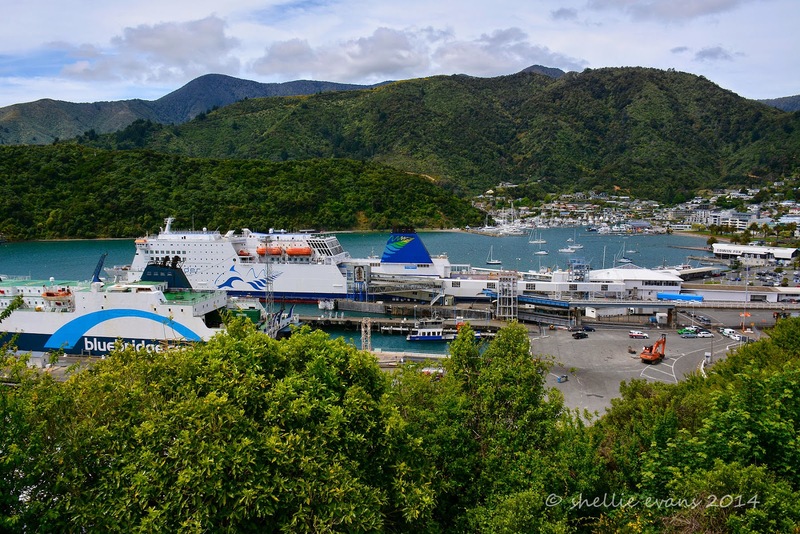 Once we got to the other end and stopped at the lookout over Picton wharf I realized that a lot of traffic would have come off the ferries that had recently berthed. 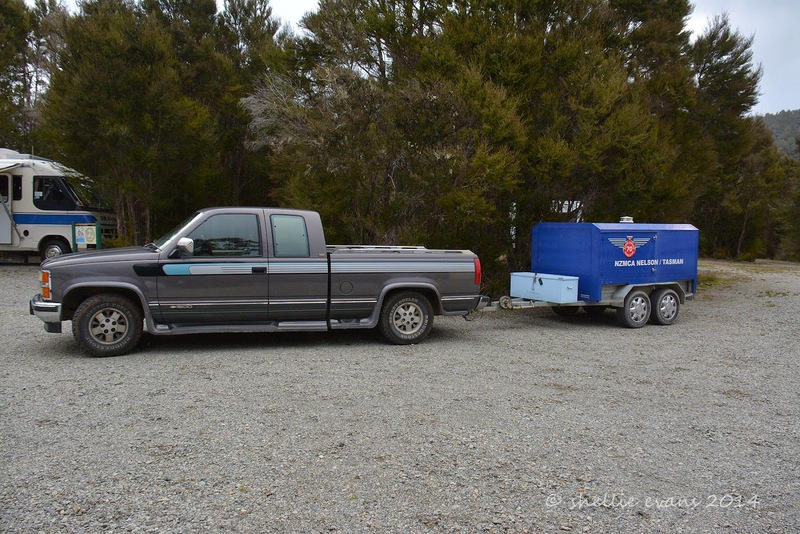 We stopped in Picton to top up the tanks with diesel & petrol(generator), fill the gas bottles, fill with fresh water & dump our black & grey water tanks- thankfully all at the one service station which was great. Next was the supermarket to replenish the fridge, freezer & pantry. We’d done really well with supplies and the only thing I ran out of was milk although I still had one carton of long-life milk left, and powdered milk if things became desperate (yuk). But it was nice to get fresh veges & fruit, bread & eggs and top up the supply cupboard as well. Oh, and the wine- just one bottle spare thanks to a few entertaining nights over Labour Weekend. 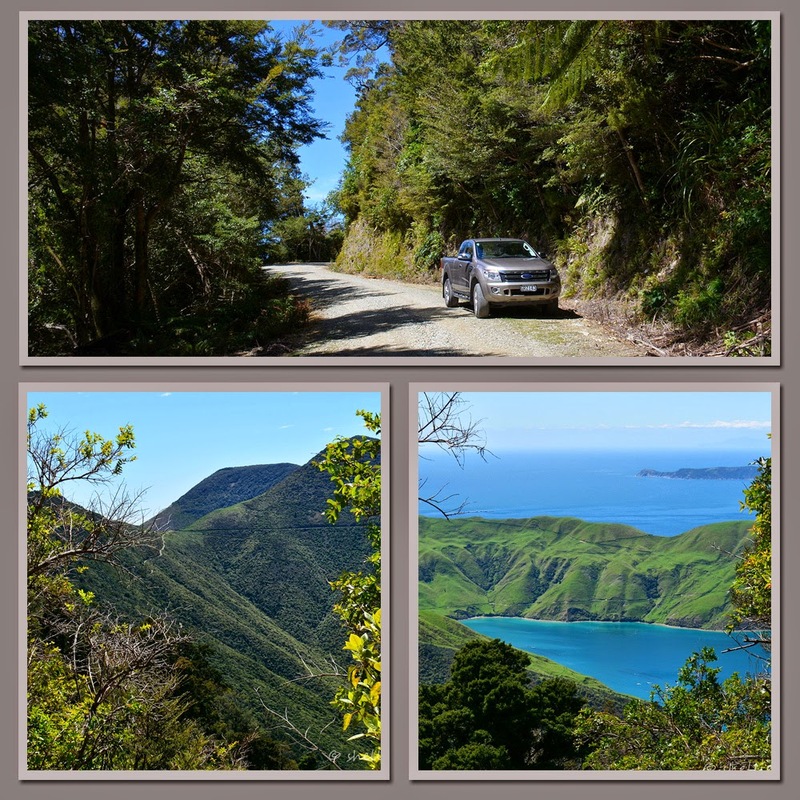 Finally we were back on the road and heading to Whatamango Bay another 10kms further on past Picton on narrow winding road (no surprise there!) 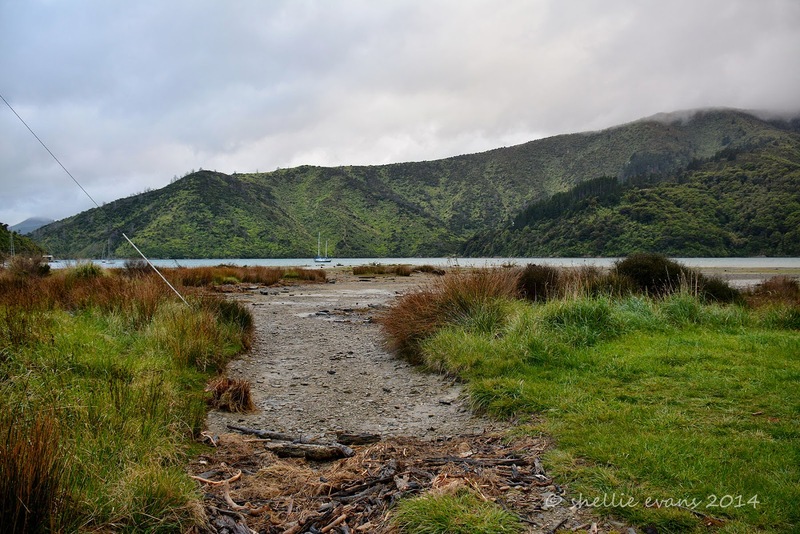 The wind was picking up and storm clouds gathering by the time we pulled in and even though we set up camp down by the water we were tucked in behind some low bushes and around the corner from the main wind which was blasting down the bay. Whatamango is another large site but it doesn’t quite have the same appeal as many of the other DOC camps that we’ve been to in the Sounds have. The tide was out when we arrived but by the look of it I think it must roll in here which just happens to be very near the front of our vehicles. It’s not a tidy looking bay, with lots of driftwood and debris scattered about and exposed mudflats. I know the weather has a huge bearing on first impressions of a place but unfortunately this one isn’t doing it for us. Maybe we’ve just been spoilt too much with the sites we’ve already visited but we’re both not that impressed with this side of the Sounds. 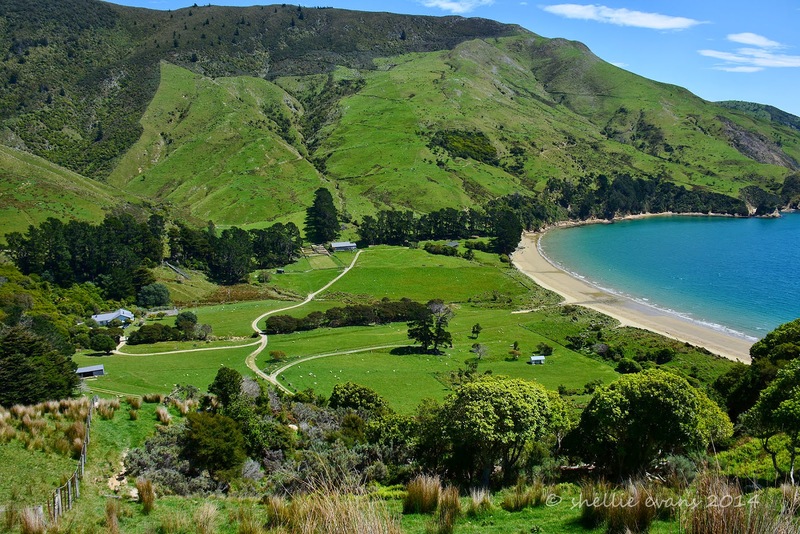 We were going to move onto to Whites Bay or Robin Hood Bay on the east coast after this stop but we’ve now decided we’re going to head to Nelson Lakes for the next couple of weeks. We’ll explore the east coast side another time, I think we’ve just had too much of the same scenery for now. We might not be too impressed with the site but these couple of crazy ducks are even less impressed with us. They think we’ve brought intruders to their patch. 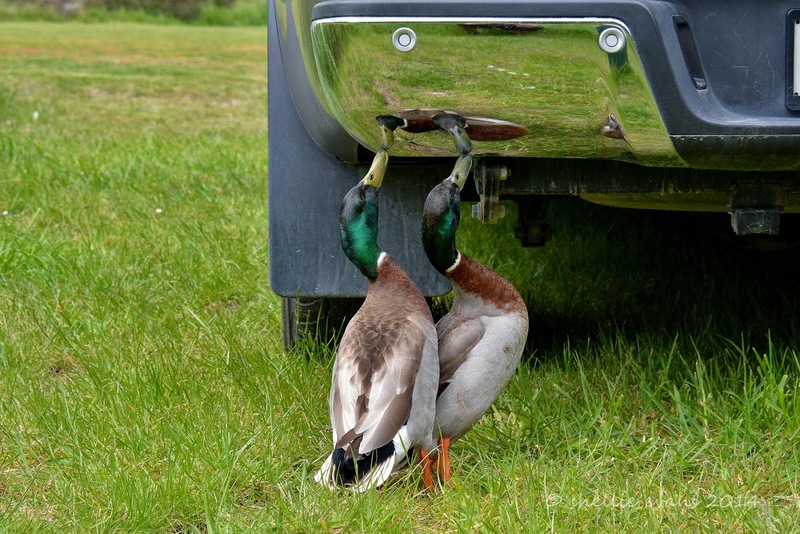 I thought, at first, that they were pecking the bugs off the bumpers but after half an hour of quacking, head bobbing and climbing over each other I went outside to have a look. 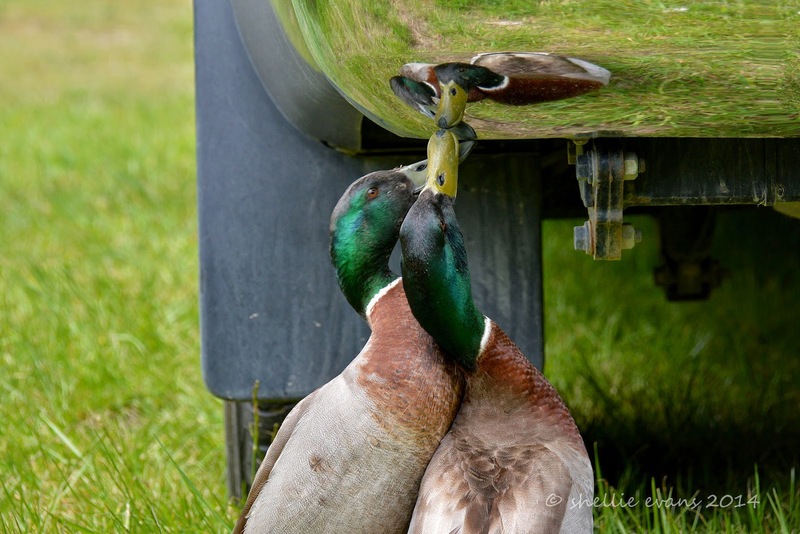 They were attacking their reflection, silly crazy ducks. I think they were a little crazy anyway, they’re either brothers or two drakes in a relationship. They wander everywhere together, side by side, they play in the puddles and rest together, it is quite sweet how much affection they have for each other. But now they’re starting to annoy me (and David), they keep coming back and attacking the bumper. All day, they've been here and even when I chase them away, half an hour later they’re back again, quacking and dabbing at their reflections. 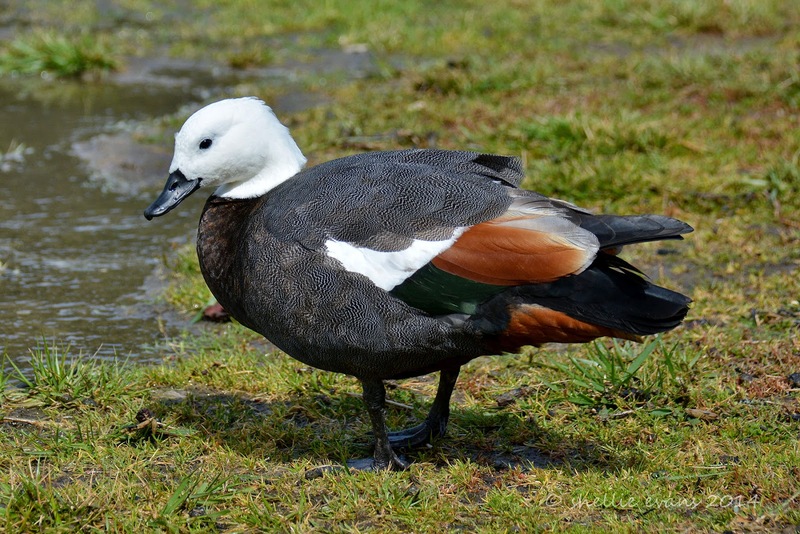 The mate of this female paradise duck spends half his time chasing them away too. The forecast gale force winds and heavy rain arrived this morning but as I type the sun is back to shining although the wind is still strong- I spoke to soon, it’s now pouring again with strong gusts rocking the van. And as I predicted the tide came creeping around the corner this morning, stopping just short of the ute. We’ll sit it out here tonight and then head to Blenheim tomorrow and onto the Lakes. And in case you’re wondering why we don’t just move further afield, I’ll let you into a little secret. We’re booked to cross back over Cook Strait in mid November. But don’t panic. It’s just for a couple of months. Family is calling and the call is pretty loud. We’ve done good to last 12 months without seeing our North Island families but we’d really like to catch up with them soon. 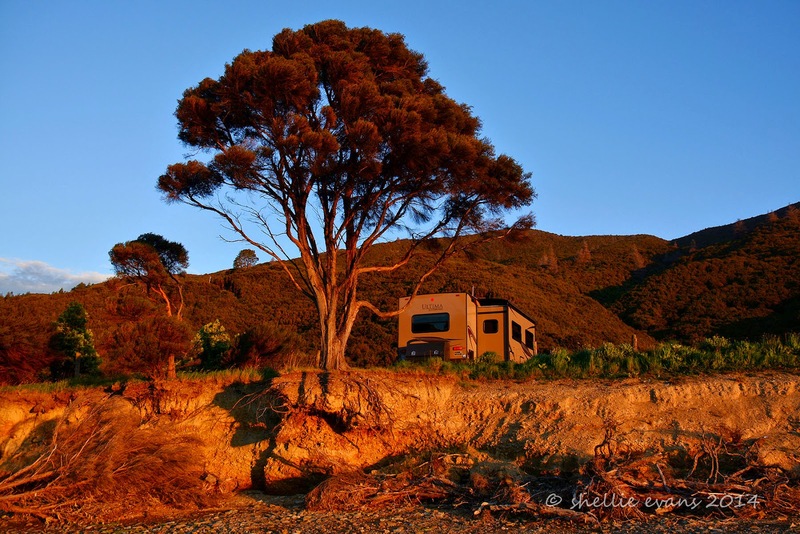 We’ll be in Tauranga late November & most of December and then Napier for Christmas & January, including going camping at the Tuki Tuki River like we should have two years ago (the two caravans have been replaced with motorhomes since then). Then we’ll cross back over late January and continue on our journey. And once again this might be the last post for awhile, I'm not sure how reception will be at Nelson Lakes. We take a left turn at the junction just past our camp site at Kenepuru Head, it’s time to explore down the west side of Kenepuru Sound. Hopewell is at the very end of the road which winds it’s way right along the shoreline, the Crail Bay Road heads over the top of the hills to, well, Crail Bay. You’ll remember we visited Crail Bay on the mail boat a week or so ago. It’s time to join the dots! The road is sealed for the first 5 or so kilometres but soon turns to gravel & it’s just as winding as the road into Kenepuru Head. 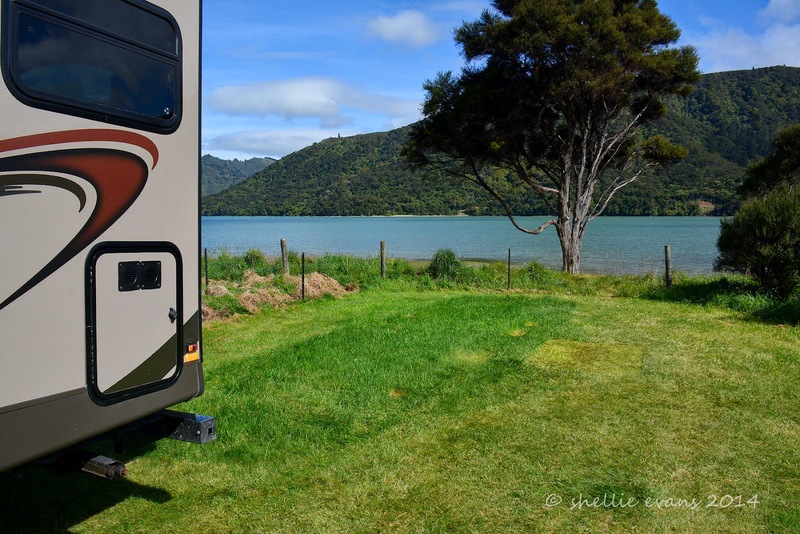 There are more houses & farms along this side & just before the gravel starts we come across a large grassed area on the water’s edge which is a freedom camping area, one of the very few sanctioned freedom camping spots we’ve seen on our South Island travels so far. And look what the area is called- Taradale! Now that’s a nice surprise. I grew up near Taradale in Napier, Hawkes Bay. It’s the first time I’ve seen the name Taradale anywhere else in New Zealand. The waters of Kenepuru Sound are silky smooth, not a ripple to be seen and the colours are amazing with so many shades of blues & greens. The beautiful teal colour seems to show in the shallower waters while the deeper bays and channels are a deep blue. 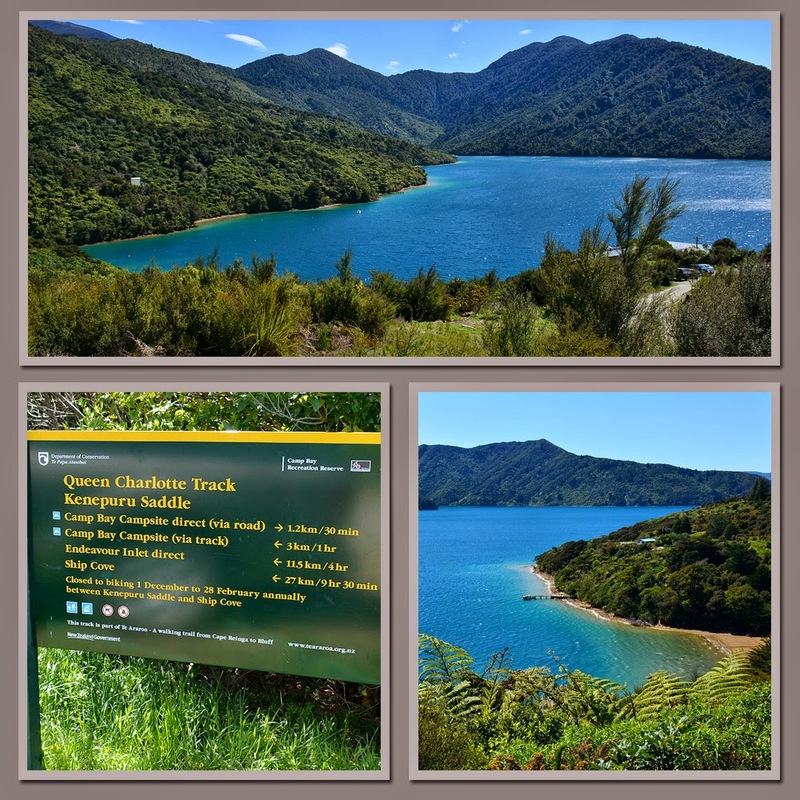 In the left photo above you can see dead wilding pines dotted through the bush on the ridge in the background, the ridge that separates Kenepuru & Queen Charlotte Sounds and where the QC Track runs along the top. Wilding pines are a major pest problem in NZ, seed from commercial pine forest blocks (like the one shown in the bottom right photo) is spread far and wide and because pinus radiata is such a fast growing tree, the seedlings soon take over in the native forest. Each wilding pine has to be individually poisoned, men are either helicoptered in or have to fight their way through the bush to each tree. Once it dies the tree’s skeleton will slowly rot and eventually collapse (or crash) into the bush and rot away providing food and mulch for the native forest. This has found to be the most effective way of getting rid of the pines and it must be working because we’ve seen whole hillsides of dead and dying trees on our travels. This very bright red bach stuck out like a sore thumb amongst the blues & greens of the countryside. I liked the sign; ‘The Wharehouse’- whare is Maori for house/home so what they are saying is ‘The Househouse’. A bit like the new horse I got the year I took French at high school, I named him Cheval! Someone obviously loves doing woodwork in the area & donating it to the community, there are a few wooden seats placed at odd spots, the sign back at Taradale & now this one nailed to the power pole. Strangely enough we never have this problem, you can’t argue with Mr TomTom. And anyway we’re never lost, we’re just exploring. 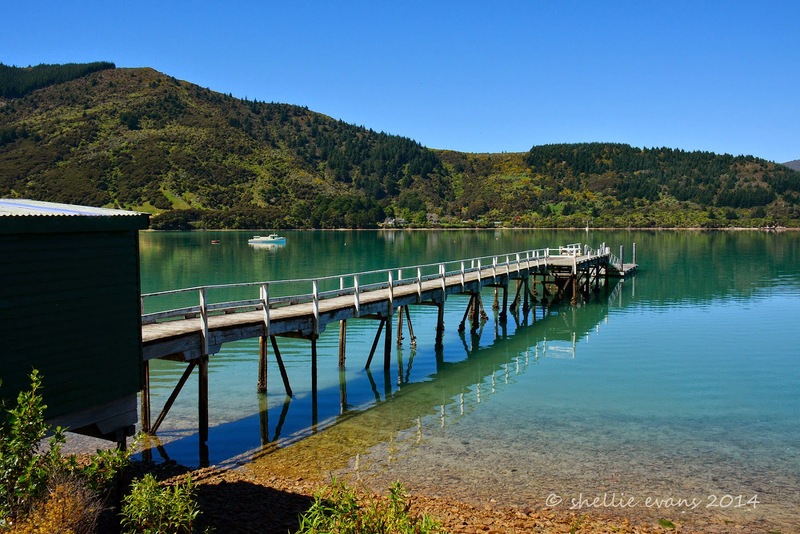 There are quite a number of holiday homes and farms at Waitaria Bay and a long jetty, many people must arrive by boat from Havelock to this side of the Sound, it would save a long 60km plus road trip. There are also some gorgeous old boats moored in a lot of the bays, including this beautifully restored launch. I love the chimney stack colour, just like the big ships. 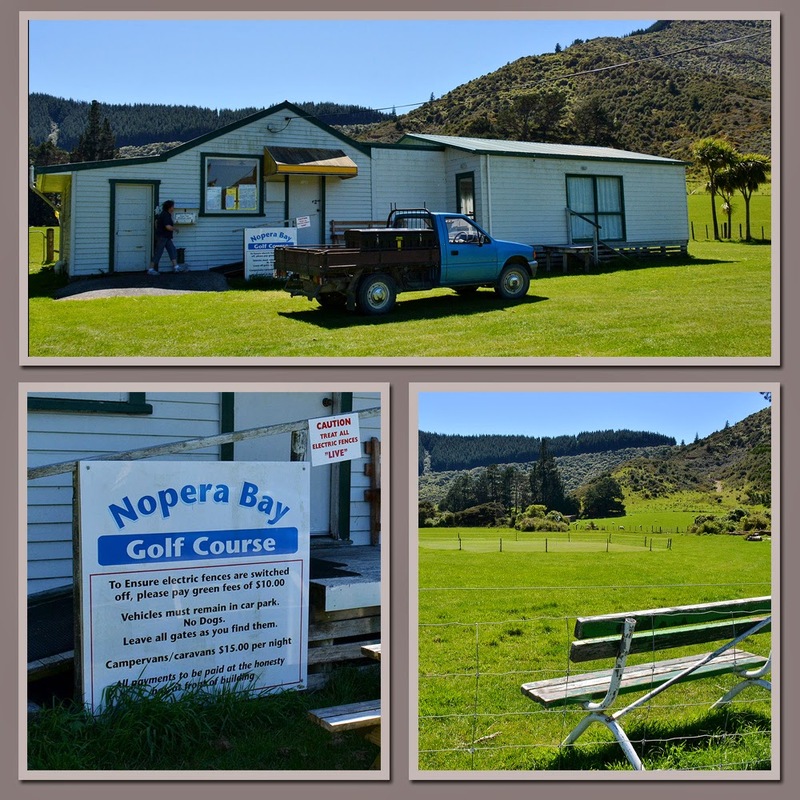 I’d seen on the map that there was a golf course at Nopera, another tiny settlement not too far from the end of the road. We had discussed whether we’d take our golf clubs with us and have a game but in the end decided that we’d just explore this afternoon. We stopped to have a look on our way past though and found the greenkeepers wife doing some paperwork in the office and she offered to show us through the clubhouse! Her husband was out mowing the greens and she told us that while the membership was dropping, they still had enough members to play club days once a month. And look at that sign board, there’s that Kiwi humour again. The car park is also a park over property for motorhomes & caravans, although a little expensive when you have a freedom camping site further back up the road. We have seen some weird & wonderful front entrance ornaments on our travels but I think this one takes the cake! David can’t get over the amount of ‘junk’ & super sized knick-knacks that people adorn their gates, fences and driveways with. I tell him this is the rural take on gnomes in the garden. Just before the end of the road at Hopewell (where, miles from anywhere, there is of all things a backpackers lodge- do they drop in by parachute I wonder?) we pass this luxury lodge with it’s very own jetty. On the way back we stop so I can take a photo and the manager just happens to be walking up from the jetty. 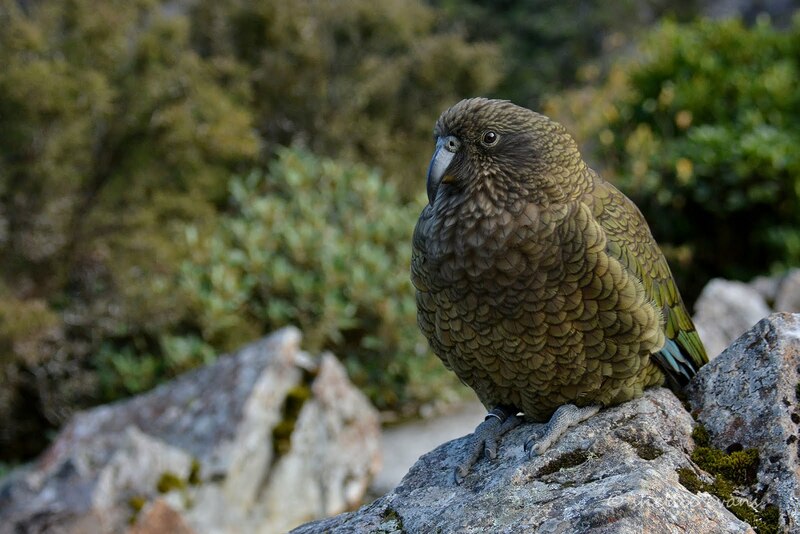 He stops to talk to us and tells us that Raetihi Lodge has new owners & has just had extensive renovations and had only re-opened a couple of weeks ago. 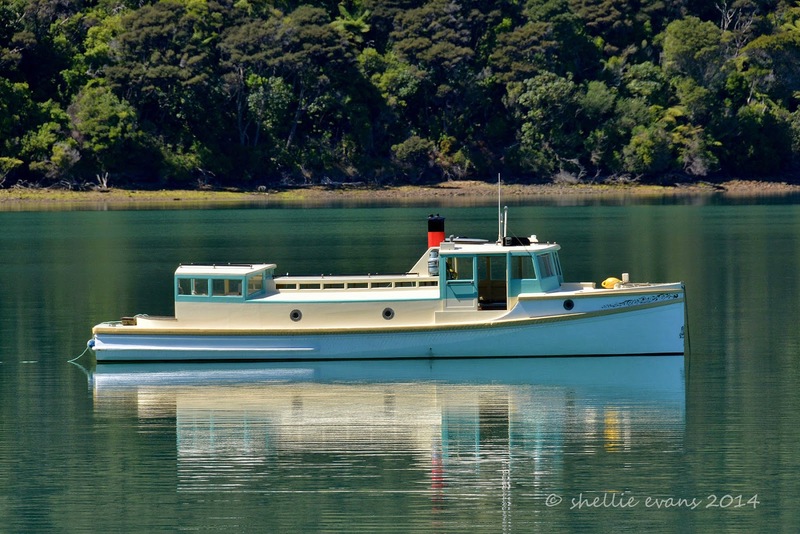 He had just run guests in the boat across the Sound to Portage where he had then taken them over the saddle to Queen Charlotte Sound where they’ve caught a water taxi back to Picton. The men in the party had been fishing while the women had been pampered. He invited us in for coffee but we declined as we still had some exploring to do. We head back along the road for a few kilometres and then take the side road to Crail Bay passing this gentleman in his weird contraption along the way. It obviously didn’t have any suspension because he gingerly raised himself from the seat everytime he passed over a rough patch as he approached us. It was 14kms to the end of the road and after a steep narrow wind to the top of the hill we wound our way down the otherside and into Crail Bay. But I couldn’t see the jetty that we delivered the mail to the other day. A quick look at the map and I saw that this was at the head of the bay, the jetty we visited was further along the bay around the point on the right. By now we were hungry (and thirsty) and looking for a place to stop and have lunch, I was thinking a nice grassy patch on the edge of the water would be good but all we found was a gravel track into this jetty. 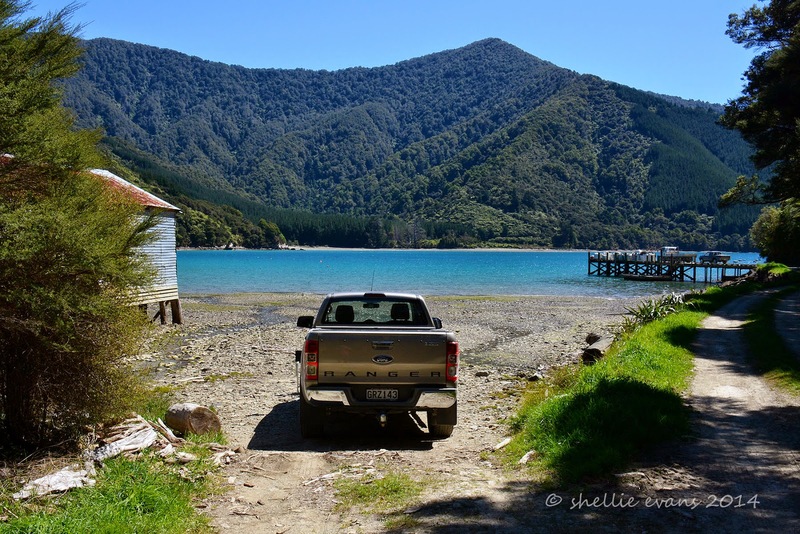 We set the chairs up in front of the ute and had our lunch in the lovely warm sunshine overlooking the bay, with not a soul in sight. If it weren’t for the two vehicles parked on the jetty we’d have thought that this side was uninhabited. Beside the track was this old cargo shed that looked to be hanging on by a thread, the piles were rotten and worn away and the far side was propped up by large poles. 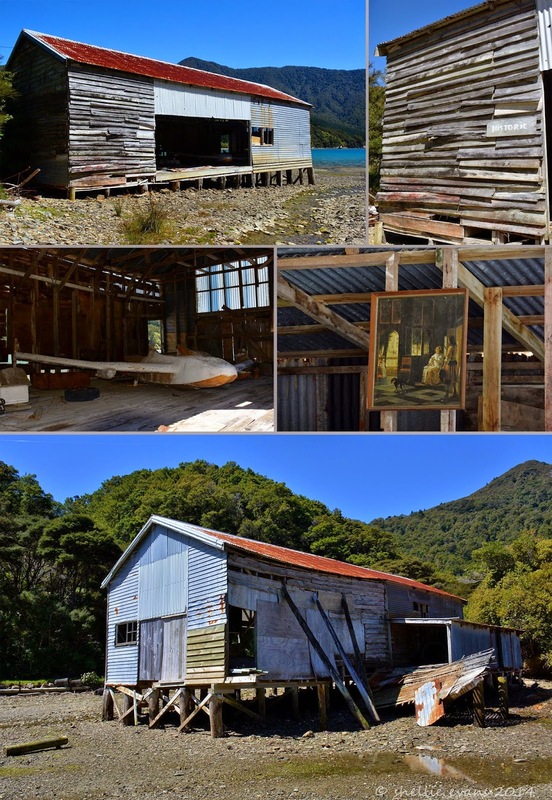 It looked like someone has used the shed as a studio/workshop at some stage as the rotten floor was covered in gear and half finished projects including a small plane. It looked like a mould plug for a flying plane or some such I thought- similar to the ones you see at the side shows. Part of the shed had been added on to and someone has helpfully added a sign indicating the back wooden plank section was ‘historic’. I wouldn’t bet on it standing for much longer given the ferocity of winds in these parts. We decided we just couldn’t take any more winding gravel roads and decided to head for home instead of driving the final 6kms to the end of the road which meant we didn’t quite get to join the dots with the Crail Bay mail jetty. Meet Bluey the labradoodle. Bluey was one of at least a dozen dogs that came camping at Kenepuru Head with their owners over the long weekend. This DOC camp allows dogs which is obviously why it’s a popular place amongst dog owners. 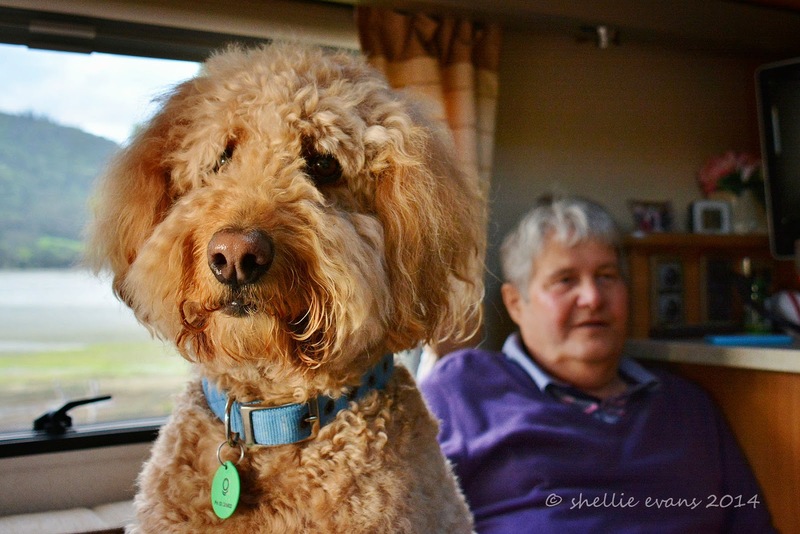 Bluey knows his place when he goes camping, it’s right up there beside Mum & Dad in their motorhome and when they’re busy entertaining and he gets bored, he likes to sit in the drivers seat keeping a watchful eye on passing dogs. And wekas. ‘If only I could catch one’ he thinks, as he tries to squeeze out the window. Bluey is very good at high-fiving for treats. He knows the routine and he likes showing us how he does it. Again and again. He’s got the measure of his doting ‘parents’ Jan & John. Bluey you are a darling. Most of the time. 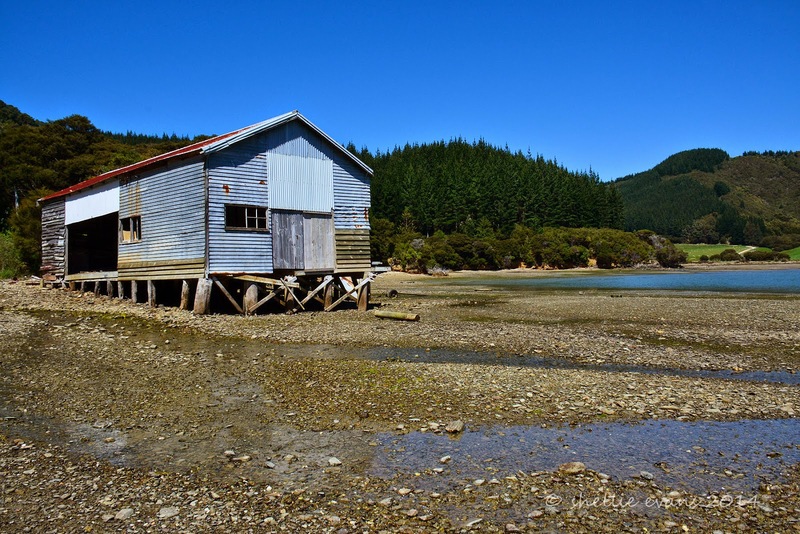 Similar to the Pelorus arm of the Sounds there aren’t too many roads along the Kenepuru arm to explore either, although there are quite a few tiny settlements with a handful of houses and holiday homes. 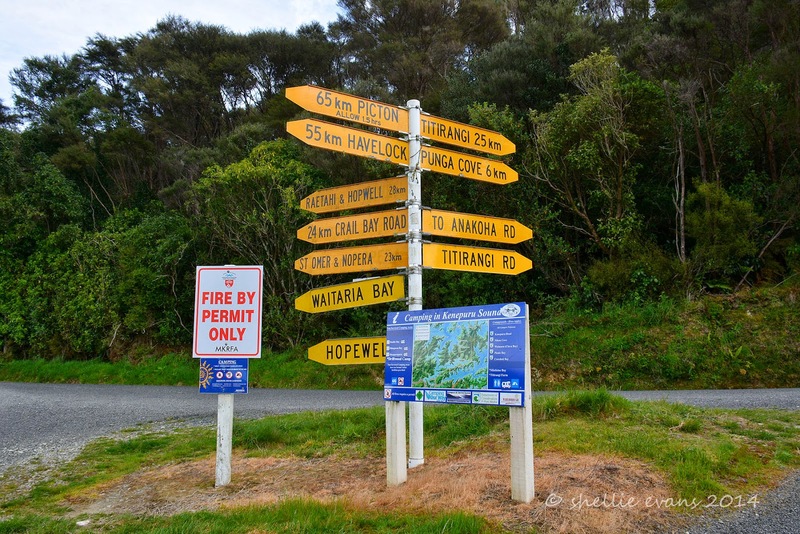 Just up the road from the campground is the one & only ‘major’ road junction, it’s 45kms from the beginning of the road and 25kms to the end at Titirangi Bay. Once again 25kms doesn’t sound like far but on these winding metal roads they seem to take forever and especially when you’re stopping regularly to explore and take photos. 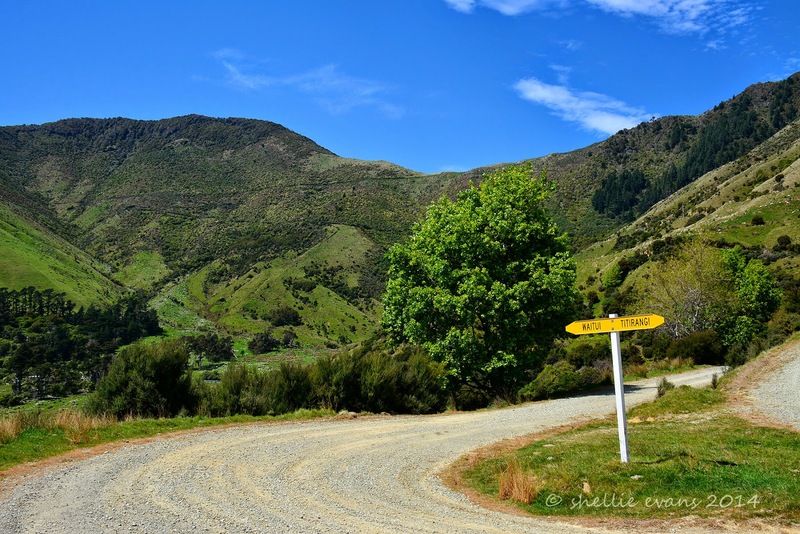 The road at first runs through farmland up the Kenepuru Valley behind the head of the bay before climbing sharply up to the top of Kenepuru Saddle. 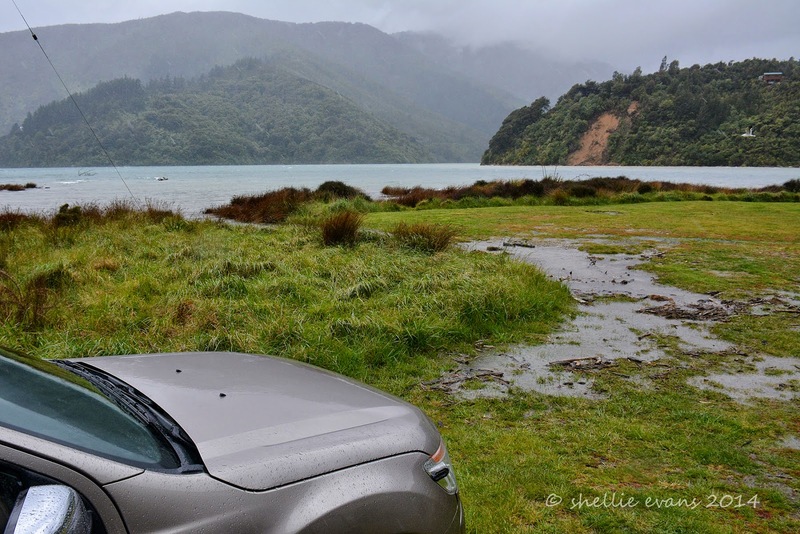 Our first stop is at the Punga Cove turn off which is also where the Queen Charlotte Track crosses & also meets the Kenepuru Road. 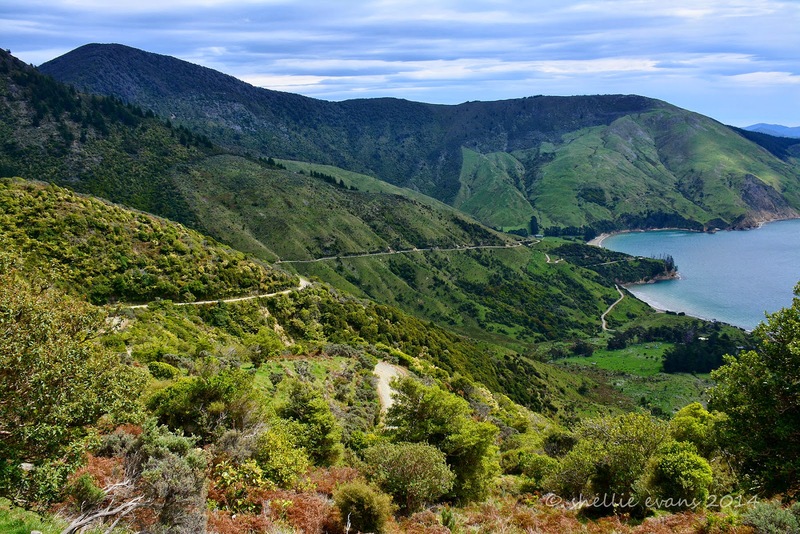 The QC Track is a 71km 3-5 day walk that tracks along the ridge between Queen Charlotte Sound & Kenepuru Sound. 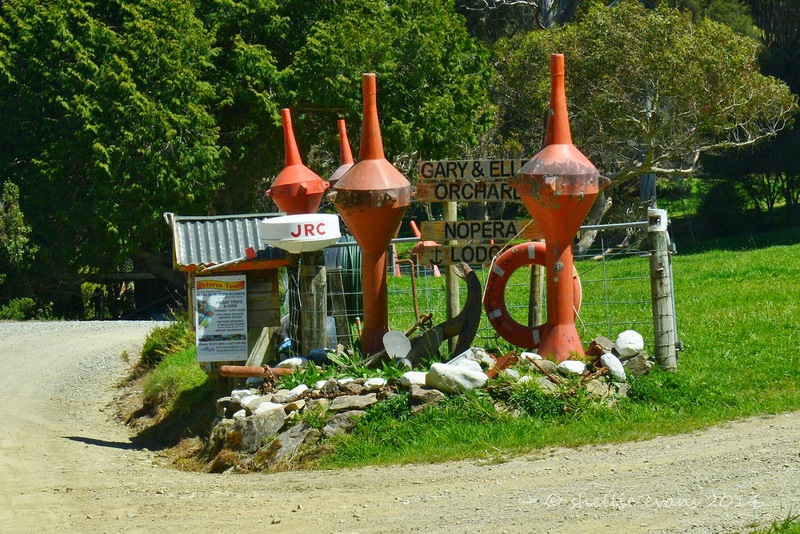 Most of the accommodation and views of the bays & coves are out over Queen Charlotte Sound and this junction is one of only 2 or 3 that gives access to the Kenepuru side. Twenty percent of the QC Track passes through privately owned land, especially at the beginning, and a Track Pass must be purchased before walking the track. 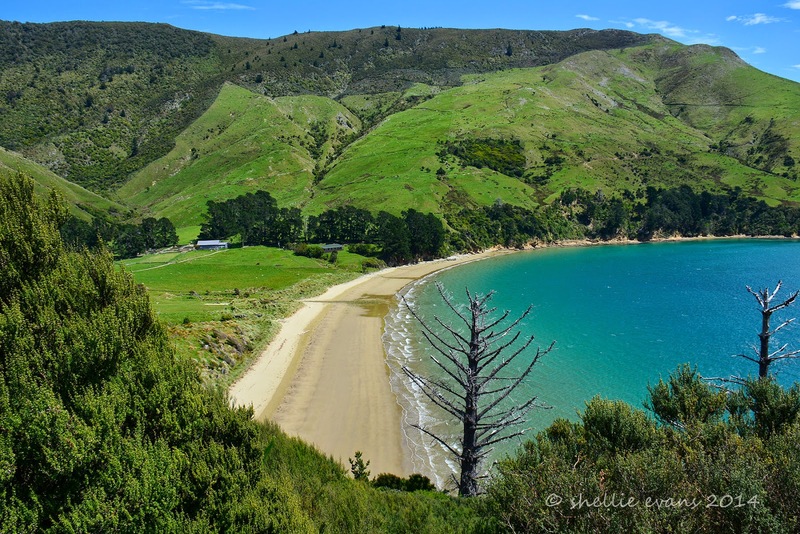 The section from Punga Cove around Camp Bay & Endeavour Inlet and on to Ship Cove is Crown land and provides day walk options without having to buy a pass. Two vehicles arrived while we were stopped, their occupants heading off towards Camp Bay. 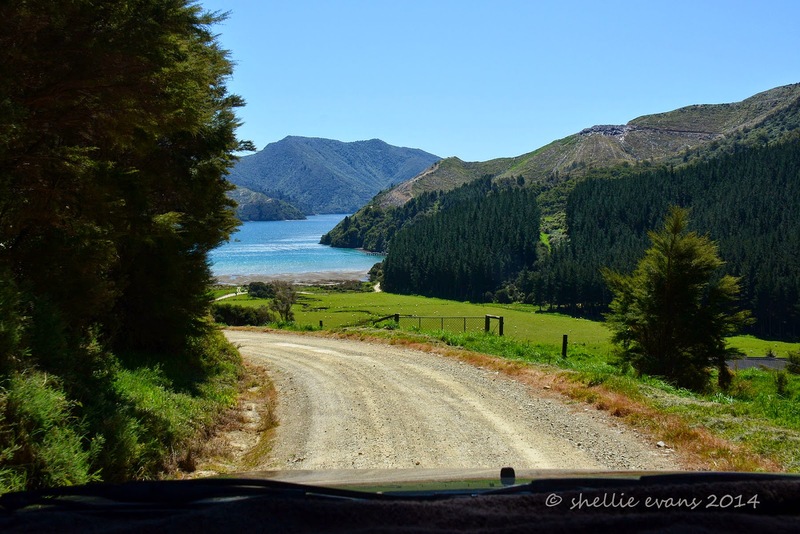 We drive the short distance down into Punga Cove and get our first view of Queen Charlotte Sound. 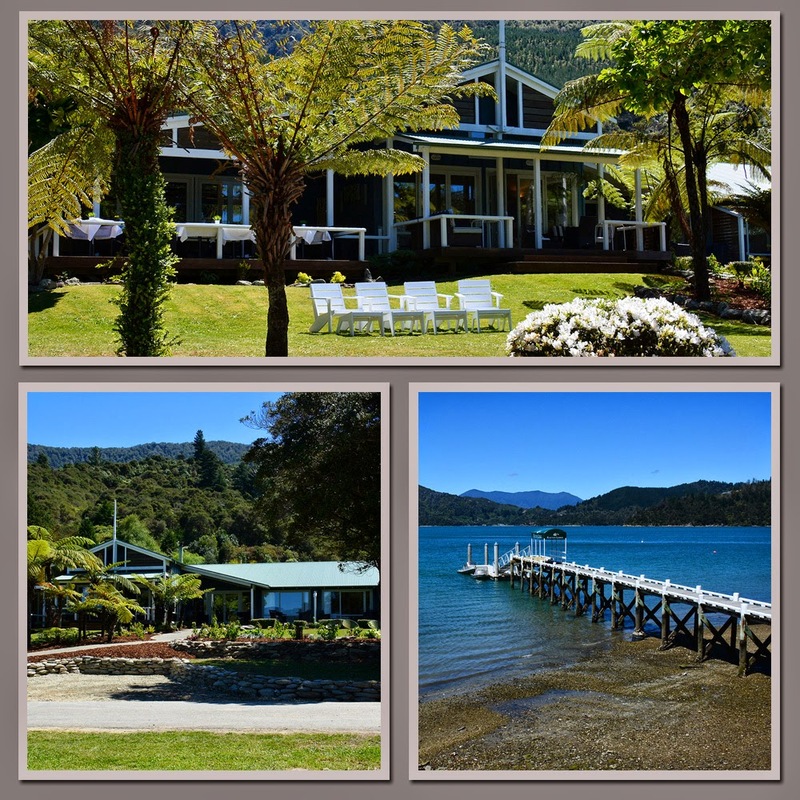 The road leads directly into the Punga Cove Resort (very steep) and we can also see Mahana Lodge just across the point, both provide a range of accommodation options for track walkers. I always wonder what overseas visitors think when they arrive at a NZ ‘resort’. Images of golden sand beaches, beautiful swimming pools, swaying palms, luxury rooms, sun loungers & bronzed bodies come to mind when I think of resort. NZ resorts are quite a bit different. We carry on along the road which continues to climb higher & higher. 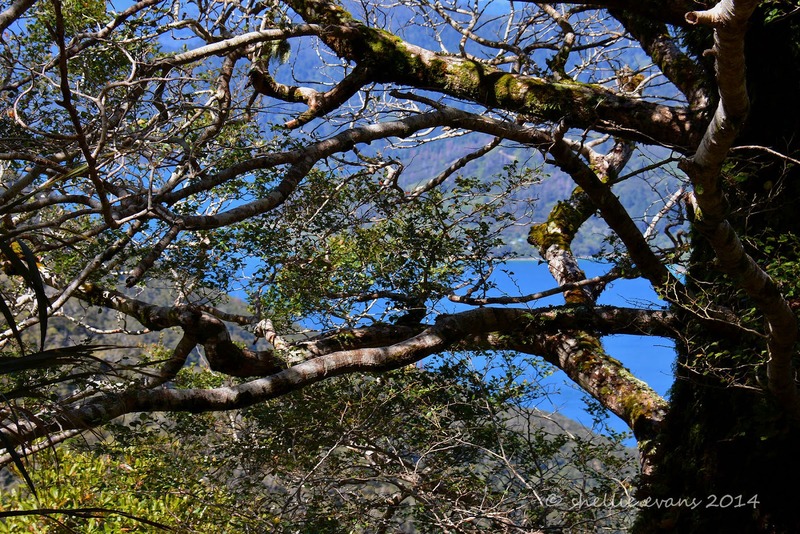 Through the trees and bush we catch tantalizing peeps of Queen Charlotte Sound but no wide open gaps where we can see the water far below. We both think that the ‘powers that be’ should at least include a couple of look outs along this section of the road (and in fact on the road in too). First it would stop people from parking their cars on the road in dangerous positions and secondly if you’ve driven all this way in from the main road it would be great to see something for your money! Below was the one & only reasonably clear view of Endeavour Inlet we had and I had to stand on the back tray to get a little more height. Across the water to the right is the historic Furneaux Lodge, a popular place for boating holidaymakers to visit over summer. Exploring, as we are on our travels, has been great, I’m able to put names to places. I didn’t realise that the lodge and Endeavour Inlet were so far out in the Sound. Sadly this part of the Sounds will always be associated with disappearance (& murder) of a young couple on New Years Eve 1998. The road ahead of us winds around the edge of Mt Stokes (1203m), there’s a 5 hour hike to the summit which seems rather excessive, this must be a minor peak. We won’t be doing that walk any time soon. We stop a few more times when I catch sight of gaps caused by windfall ahead of us, some I can see over the top but most don’t have clear views. Even though the road has a lot of twists and turns we’re both surprised at how wide it is in places, especially this far down the arm. It feels like a four lane highway compared to some of the gravel back roads we’ve been on recently. Through one gap we can see the road winding up the hill ahead of us and we think we might have to take the road to the right but in fact our road drops over the ridge at the junction with a farm track that cuts across to the right. And down below us we can see Melville Cove which is at the top end of Port Gore. We’re now in the outer sounds. 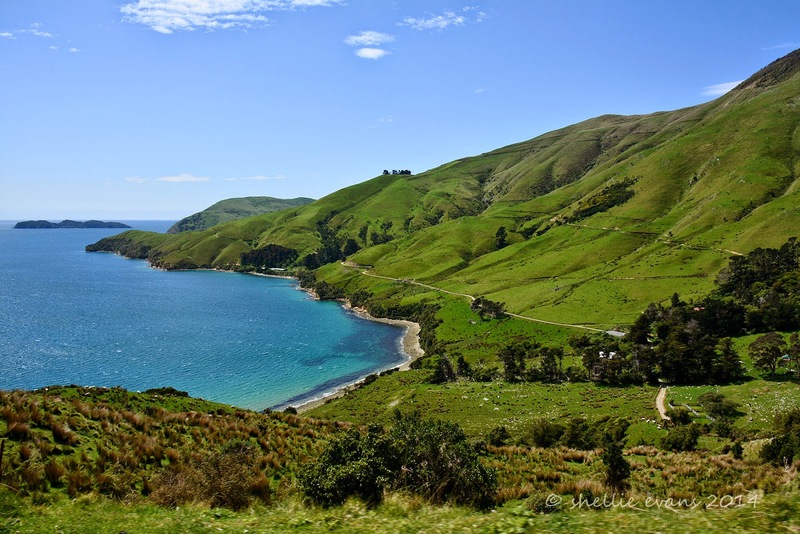 Further on and finally we break out of the bush and have a clear view across Port Gore to the long thin finger of land that is Cape Jackson, which points out to Cook Strait. 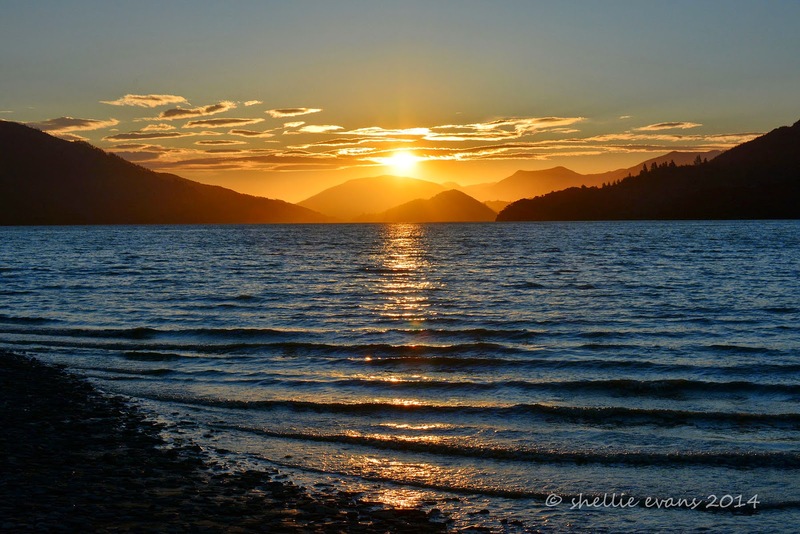 The outer Queen Charlotte Track also finishes at the Cape. Port Gore is the final resting place of the Mikhail Lermontov, a Soviet cruise ship that sunk in 1986. The ship in the care of the Marlborough Harbourmaster, & carrying 750 passengers & crew, hit rocks as it passed through a narrow passage between Cape Jackson & the old lighthouse. One person, an engineer, died as the hull was ripped open and there were also 11 injured people but passengers & crew were rescued before the ship sunk. The ship, badly listing, limped into Port Gore where it lost all power & got stuck on a sandbank. The incoming tide lifted it off the sandbank and the ship then sank, 5 hours after the initial impact. Below is Melville Cove (Port Gore) with those ever present mussel farms blotting the seascape. This is taken from the the road junction with the farm track. We’re quite a height above the Cove, you can see the slope on the left is covered in ‘tiny’ punga ferns (tree ferns) which will give you a bit of perspective. We’ve finally reached Titirangi, we’re heading down to the Farm Park for a picnic and to check out the camping site. At least this time we don’t have to stop and ask permission as we did in Bulwer. Titirangi Farm Park is crown land that is leased out. Again it looks like our road cuts around the edge of the hill when in fact it doesn’t, it drops down to the left just around the corner ahead of us and winds for 3 km all the way down into the bay. The view down into Titirangi Bay is spectacular, some might recognise this photo as the one that appeared on TV One’s weather a few nights ago. 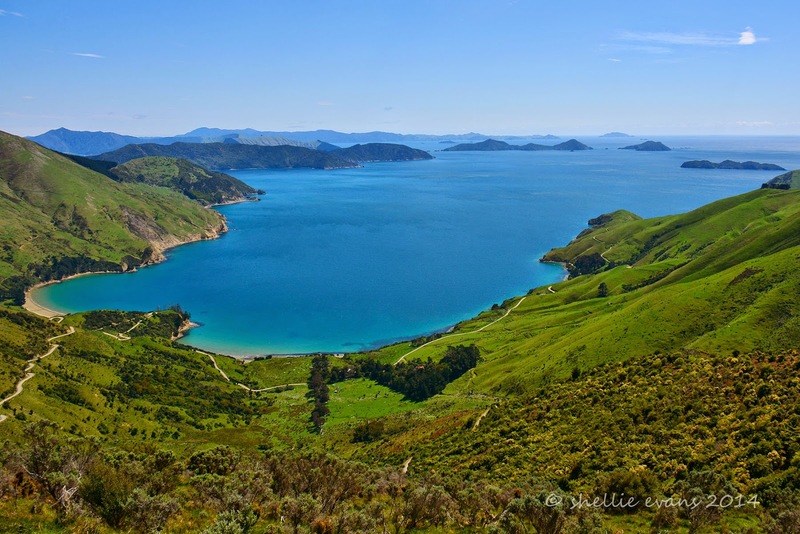 This is looking north-west towards Pelorus Sound with some of the outer sound islands dotted across the horizon. We stop near the bottom as the left hand side of the bay comes into view, I can see a little kiosk in the middle of a paddock and assume that’s where we’re headed. There’s also lovely smooth expanse of inviting white sand on the beach, one of the very few sandy beaches in the Sounds. On the other side of the small ridge, the road passes along the front of a large sheltered homestead and farm buildings, this is Waitui. 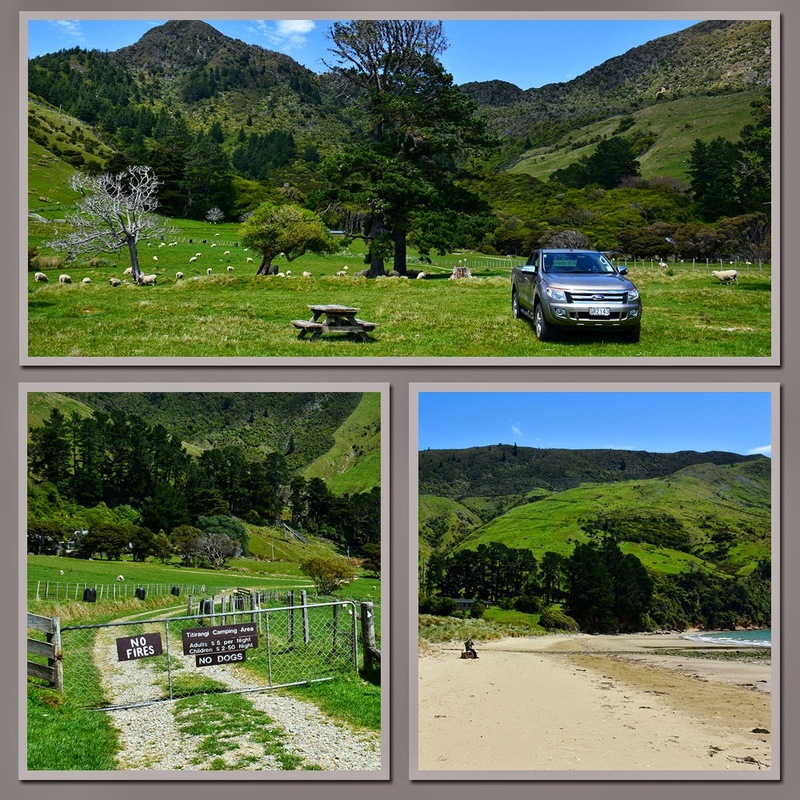 We head left to Titirangi opening the gate and driving down to the picnic table disturbing the resting & grazing sheep along the way. What a great place this would be to camp (except for the rather large sheep poo! ), a fair way out and a tough road down to the bay but once you were here, paradise! The ‘kiosk’ turns out to be the toilet/shower/kitchen/laundry block complete with a stock gate to keep the sheep out! Of course it’s basic (what do you expect for $5) but perfectly adequate. There are 4 narrow flushing loos on the other side, a shower to the left and tubs for everything else on this side. 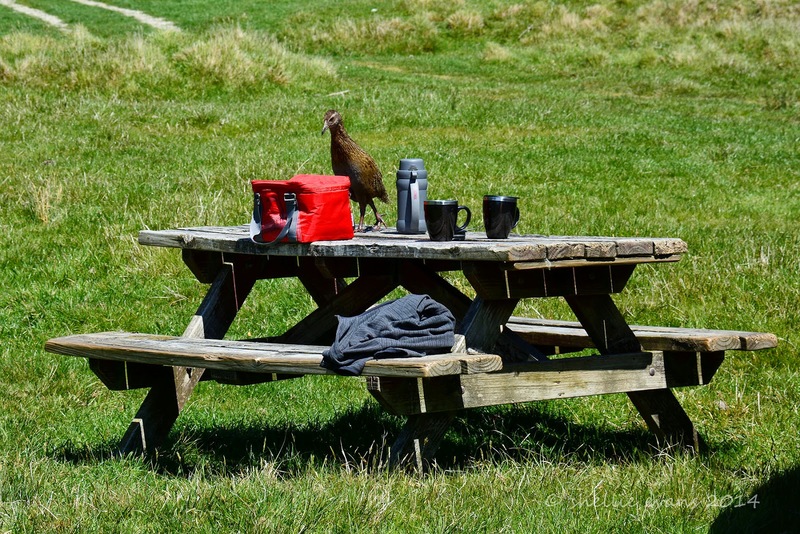 And what would a picnic be in the Sounds without a weka making itself at home! Once again there were about half a dozen birds who quickly came over to see what we might have for them- in between chasing each other around the paddock. 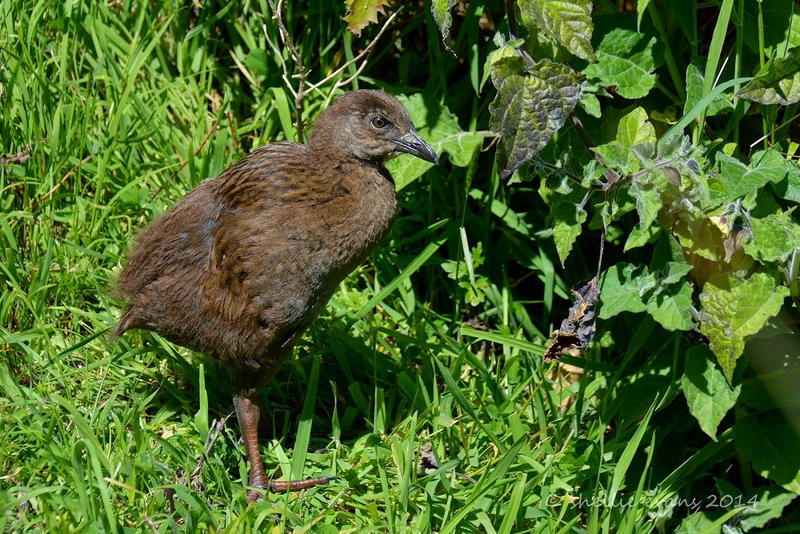 We’re now familiar with the habits of these birds and it didn’t take long for us to pick that one bird had chicks hidden in the undergrowth over the fence. She gathered up the pieces of bread I threw her, stuffing her bill full before running as fast as she could back along the fence line disappearing under the bottom wire and through a gap in the bushes. She must have had very young chicks as they didn’t make an appearance while we were there. Another bird did the same but ran back across the paddock to some reeds, we could see two large chicks wandering about beside the stream and when I went over to see them one was more than happy to check me out. It’s sibling ran off and hid but this one kept coming closer until it’s parent squawked and must have told it to come away. It sauntered off down the sheep track in the general direction of the parent pecking at this and that, looking around and taking its time. Just your typical teenager. After finishing our lunch & a walk along the beach we packed up and headed back to the turnoff for the long climb back out of the bay. The road is steep and narrow and while it wouldn’t be so bad towing the 5th-wheeler in or driving a bigger rig, it would be a tough haul out of the bay when it came time to leave. 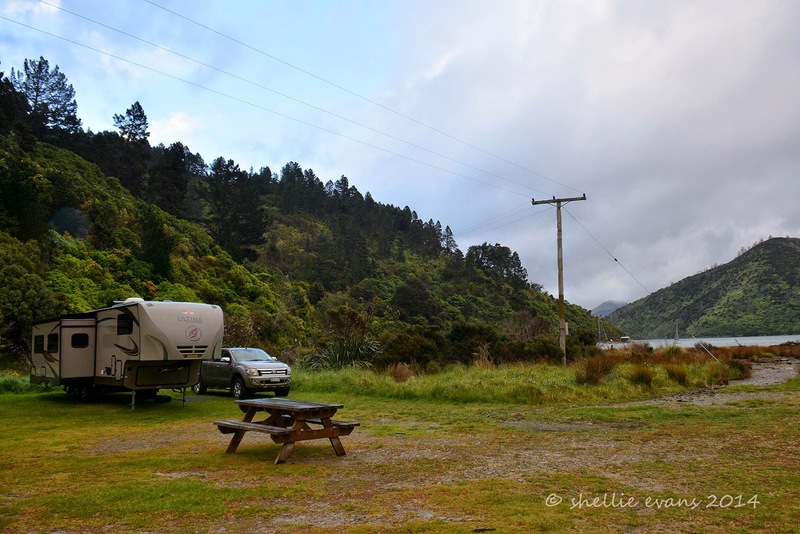 Although we decided, if we did want to come here camping another time, it probably wouldn’t be wise towing anything down the road because of the narrow hairpin corners, many of which are hidden behind that first bend. 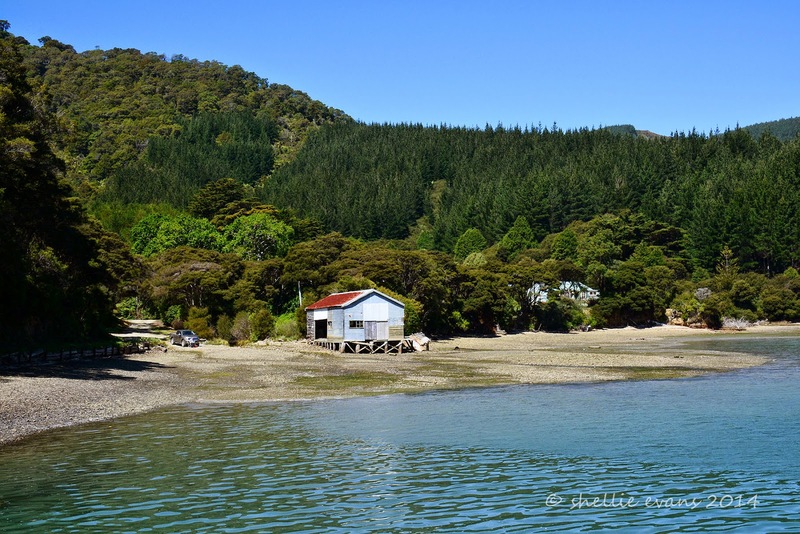 Once again we had a lovely afternoon exploring and while we’re enjoying the Kenepuru arm of the Sounds we both think the Pelorus side has superior views; perhaps that’s just because we couldn’t see them on this side.